Quiche is the wild card of foods. It can be served for breakfast, lunch, and/or dinner, can become as healthy or indulgent as you want it to be, can be prepped in advance, reheats well, and is a great way to use up left overs. Not to mention it is EASY. So, needless to say, we eat quiche rather regularly. The recipe I’m going to share today is our latest adaptation, which uses coconut flour for the crust making it grain/gluten free. I’m really happy with this option and though it doesn’t taste quite like the flaky, wheat-filled, buttery crust that your grandma would make, I think it is a relatively tasty alternative. Our family has also opted to take dairy out of the main recipe. (Most quiche recipes incorporate cream, half-and-half, or milk into the egg batter.) We found the addition to be unnecessary and instead opt to make it richer with healthy fillings. Of course one of the most popular fillings, cheese, is still a favorite, but you can replace or substitute it as needed to appropriately satisfy your dairy requirements and preferences. * Wondering how much filling to use? This part of the recipe is completely adaptable to your tastes. As a general rule, we use about 3/4-1 onion, 2+ cups of veggies, and a generous cup or cup and a half of cheese. I know, not very precise. You want the total amount of fillings to fill approximately 3/4 of your dish. Preheat oven to 350 F. Grease an 8-9 inch pie or cake pan. Beat 2 eggs in a large bowl and then add coconut flour and oil. Mix well until dough consistency is reached and can be shaped into a ball. Tip: Use your hands for mixing the ingredients together. It really helps to keep the coconut oil soft and reach the desired texture. Place dough ball into the center of greased pan. 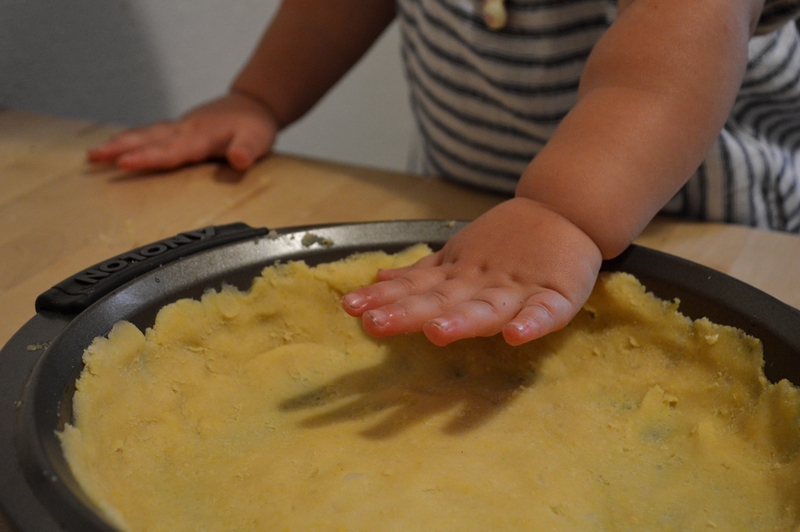 Push down, using your hands, into the base of dish and onto the sides. Add all dry fillings desired (i.e. everything EXCEPT the eggs) on top of the crust. We go heavy on the fillings and fill the crust about 3/4 to the top, sometimes more. Toss together to mix. Beat together 7 eggs (5-6 if they are jumbo). Add salt, pepper, or any desired seasonings. Pour eggs over fillings and crust. Do not fill the dish with eggs or they will overflow while baking. I found 7 eggs to come just below the fillings in our pan, which is perfect. Let sit for 5 min (optional, but I find it easier to cut & remove from pan) and then serve up! This looks great! 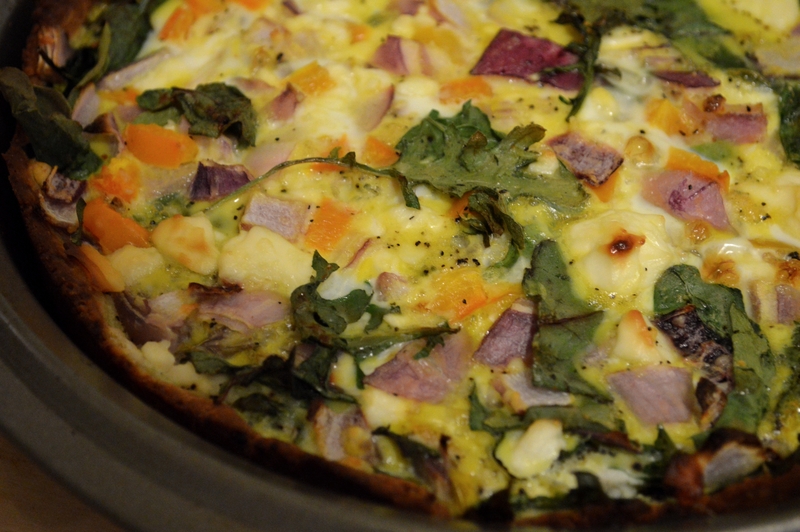 I haven’t had quiche since going paleo and dairy-free so I’m looking forward to trying this. Do you think this would work with vegan/non-dairy cheese? Absolutely! This recipe is literally baked egg in crust, so the consistency is pretty foolproof. The fillings are just there for flavor & to provide more sustenance, so any cheese alternative that meets your dietary restrictions and you like the flavor of should work!